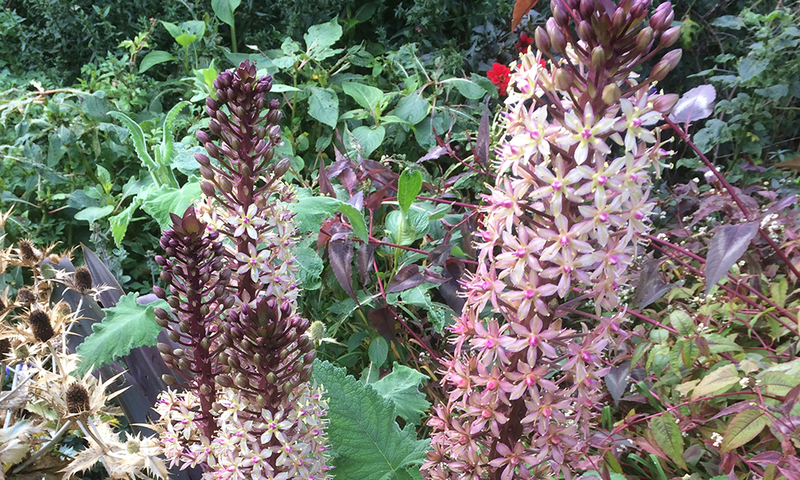 Eucomis comosa ‘Sparkling Burgundy’ is a bulbous, hardy perennial which forms a large rosette of deep red, strap-like leaves. In late summer and early autumn, an erect flower spike appears, densely covered in star-shaped flowers. The leaves can get to approximately 60cm long and the flower spikes reach 1.5 metres tall. Ideal for an unusual talking point in the garden at this time of year, it can be seen growing in the Hayrick border in the Parks. The plant prefers a sheltered position in full sun, with moist but free-draining soil – it does not like sitting in wet, cold soil. It can be grown from seed in the spring, though this is not easy; it can also take several years to get to a suitable flowering size. It is usually free of pests, although slugs can take a liking to it.